Start the pickled green tomatoes two days before, or up to a couple of weeks before, and double or triple the recipe if you want. For the green tomatoes, toss the tomatoes with the salt and let stand for a day in the refrigerator. Drain any liquid from the tomatoes. In a small pot, combine the garlic, ginger, vinegar, mustard seed and cloves and bring to a boil. Pour over the tomatoes. Allow to cool slightly, then cover and refrigerate. Preheat a gas grill to high heat or build a hot fire. Season the quail breasts with salt and pepper, then toss with the olive oil. Grill the quail breasts on each side until well browned. About 2 or 3 minutes per side. Mix together the sambal or hot sauce and the mayonnaise, adding more to taste. Toast the rolls on the grill or in the oven. To assemble, lay a grilled quail breast on the bottom bun, then top with a couple slices of pickled tomato and a dollop of the spicy mayonnaise. This sauté is quick and savory. Our quail is minimally processed and does not contain any added hormones, antibiotics, artificial sweeteners, food colors, or flavorings. 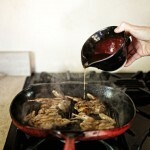 Our quail is served at many of Texas’ finest restaurants. Click here to find out where to try it. Our holiday gift packs offer a nice sampling of our products for your holiday feasts. Click below to order today.